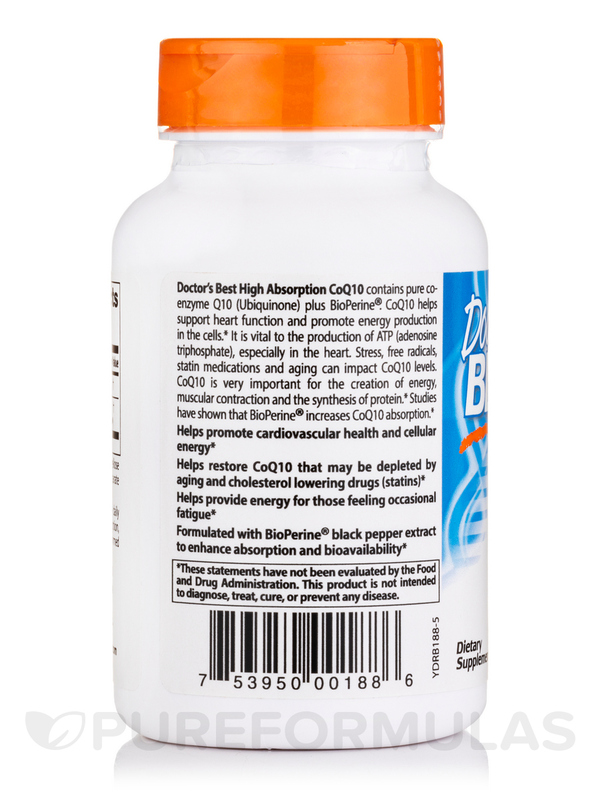 High Adsorption CoQ10 with BioPerine by Doctor's Best is a great product in a capsule. 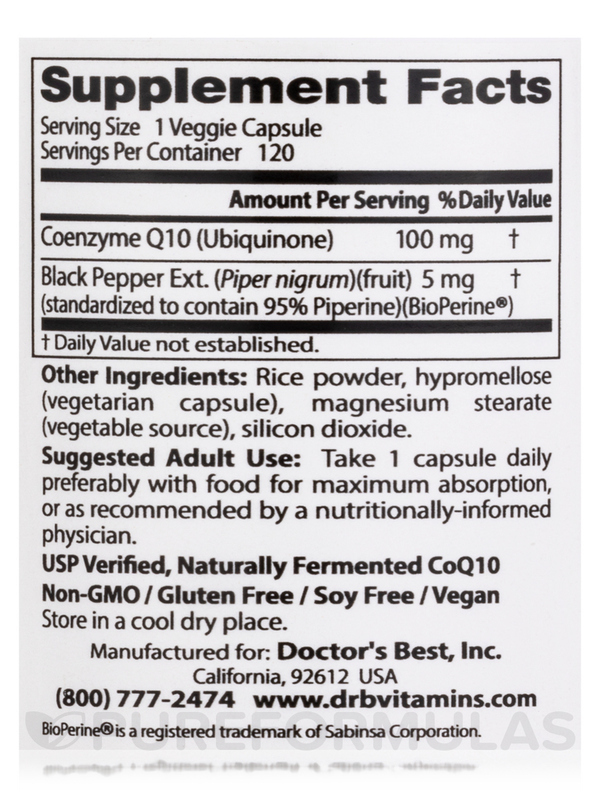 I like the capsule formulation of High Absorption CoQ10 with BioPerine by Doctor's Best rather than the softgel. Naturally Fermented Pharmaceutical Grade CoQ10! 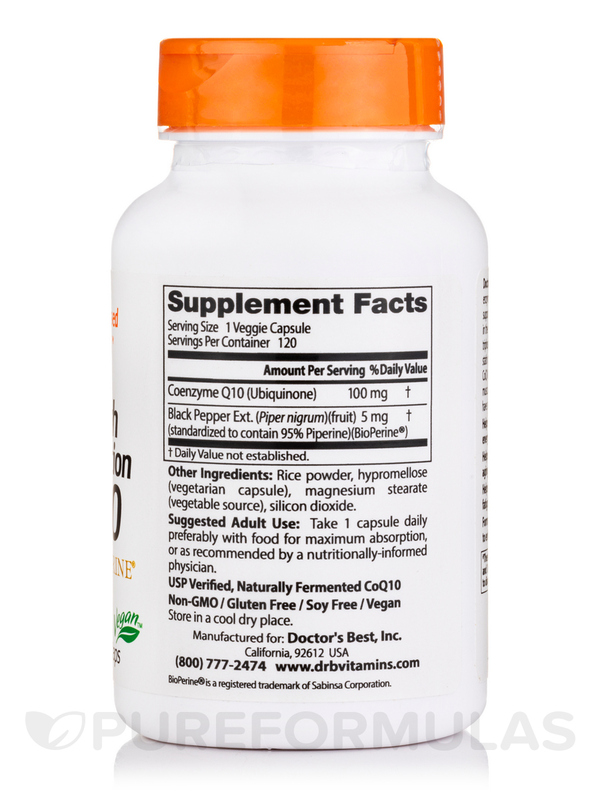 Doctor’s Best High Absorption CoQ10 is an easy-to-absorb form of a key nutrient that powers and protects the body’s high-energy organs & systems – especially the heart & blood vessels. The body’s ability to absorb CoQ10 decreases with age‚ while statin drugs for cholesterol may deplete the body’s CoQ10 levels. That’s why Doctor’s Best High Absorption CoQ10 is made to be bioavailable‚ to quickly restore your body’s CoQ10 to ideal levels associated with optimal health and cardiovascular vitality. - Supports energy production in cells. Other Ingredients: Rice powder‚ modified cellulose (vegetarian capsule)‚ magnesium stearate (vegetable source)‚ silicon dioxide. Non-GMO / Gluten-Free / Vegan / Vegetarian. USP Pharmaceutical Grade / Fermented. Take 1 or more capsules daily with food‚ or as recommended by a nutritionally-informed physician. For maximum absorption‚ take with a fat-containing meal. Take High Absorption CoQ10 with BioPerine 100 mg by Doctor's Best daily with my statins!! Helps a lot!! I bought High Absorption CoQ10 with BioPerine 100 mg by Doctor's Best, and when I opened the bottle, a potent chemical smell wafted out. So I went to this company's website. Their website looks dubious. From the looks of it, this company doesn't appear to be U.S. based, and their contact info is just a P.O. Box not even an 800 number. I wouldn't feel safe take anything from this company, nor would I buy anything from them again. Doctor's Best yeah, right. Website looks shady only P.O. Box and no phone number. 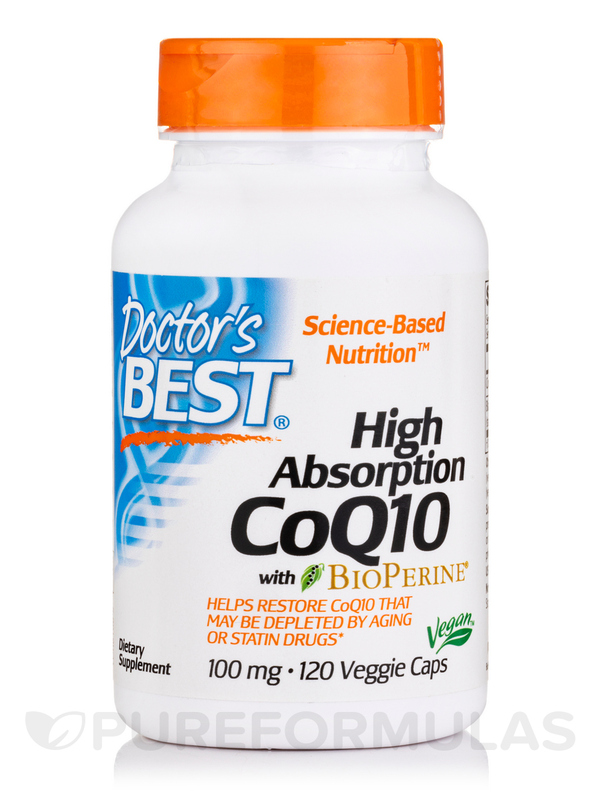 I use High Absorption CoQ10 by Doctor's Best as part of my heart health program, take 2 per day am/pm. Have used this for years with no problems. I tried High Absorption CoQ10 with BioPerine by Doctor's Best for migraines. While it's a good brand and had no side effects or stomach upset I did not have any improvement in migraines. It's good for overall health so if you take it for heart health perhaps its worth a try. Easy to take, veggie caps, Sigma Tau. High Absorption CoQ 10 with BioPerine by Doctor's Best is the only blend that helps me with the muscle cramps caused by statin drugs. Love it! I have been taking CoQ10 for the past year and strongly believe in its benefits, however Doctor's Best CoQ10 has caused adverse side effects for me on two separate occasions. I ordered a 600 mg capsule and noticed blurred vision, dizziness, and an overall hangover feeling after a few days of taking it. It took awhile for me to realize what the cause was. I stopped taking, ordered a different brand, and immediately felt better. I recently I fell for it again when I saw the doctor's best CoQ10 at a great price and in 100 mg dosage. I experienced the same symptoms after only four days. CoQ 0 has been very helpful for my symptoms of Raynauds and overall circulation to my extremities. I will go with a higher quality brand next time and remember that you get what you pay for usually. I am guessing that the ingredients are not all natural as advertised. I must be intolerant to something in this brand. I've experienced symprons with high and low dosages. Speed of delivery, quality, and ease of taking. 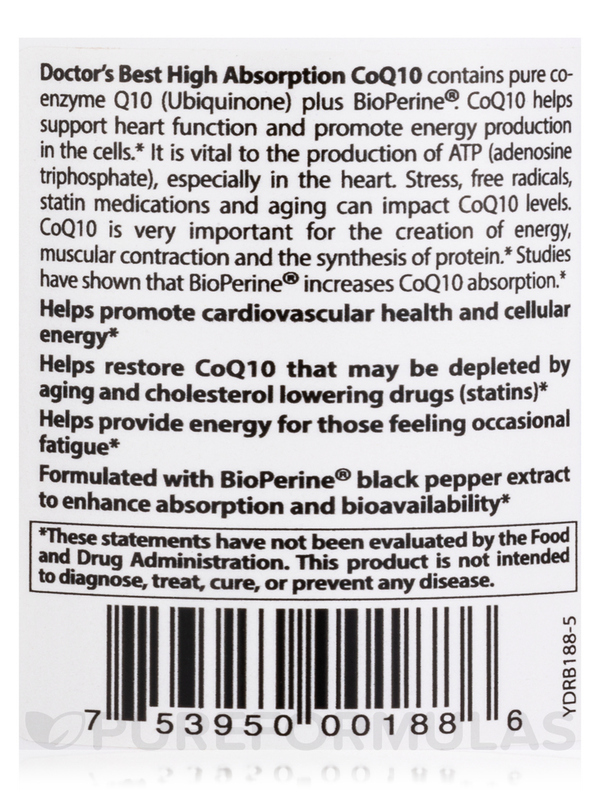 I love High Absorption CoQ10 with BioPerine by Doctor's Best. This company innovates by adding bioperine to make this more bio available. The price is really great too.